May 8, 2016 May 7, 2016 Dan O. College kids from Connecticut seem like so much fun when they aren’t speaking! Sophomore Lily (Analeigh Tipton) falls in line with a new group of gals on her first day after transferring to a new school. The group she falls in line with is led by Violet (Greta Gerwig), a fellow student who tells it like it is, thinks way too much about certain things, and is trying to get her dance craze off the ground and for the whole world to see and become apart of. Together, the two, along with 3 other girls in the group, they run a non-profit Suicide Prevention Center where they allow people to let their feelings loose, and even find a creative escape by tap-dancing. It starts to work because it makes people happy, however, they still battle for the hearts of the fellow male students they see on a regular-basis, and some can’t handle the idea of denial, quite as well as others. Whit Stillman’s films sometimes work for me, and other times, they don’t. While I’m ultimately interested by what they’re trying to say and do, by the end, I can’t help but feel like I was just talked to, rather than actually given a movie to work with. It’s almost as if I was just in a conversation with someone who is clearly high off their rocker, or just had a tad too much coffee, I sit down with them, try to bring them back down to leveled-ground, but instead, they’re so crazy and hyper, that they just end up controlling the whole conversation, making me frustrated, and then, when it’s all over, leaving me in a cloud of dust, having no clue just what the heck happened to me, or what was even said. That’s how I feel watching Whit Stillman movies. While I may think about them long after having said conversation, no way am I fully impacted. I get it, Greta! You can dance! That said, Damsels in Distress is a fun little movie in that I don’t think it ever tries to be as serious as his other movies. In fact, it’s a lot goofier and perhaps more of an actual “comedy” than anything else; whereas his other movies can be seen as “comedies”, but are more based on actual wit, with some more darker themes at-play. And this is all to say that Damsels in Distress is, yes, clever, if not very funny. Just sort of chuckle-worthy, if you will. Stillman’s script is filled to the brim with double-meanings, that are splashed with an insane amount of irony, which can make this movie work its magic a little longer. The humor does take awhile to get used to, just by how strange it is, but if you’re willing to let your shields go down on the ground, you’ll find yourself a whole lot happier and more pleasant with how Stillman frames these characters, their personalities, and everything that comes out of their mouth, whether it be just a bunch of mumbo-gumbo, or actual thoughts from the mind of a youngster. I don’t think that Stillman is trying to make any ground statement about the youth in today’s society, but that’s alright, because he doesn’t have to. He’s just having fun with some of these silly, almost caricature-like characters. But like I said, being clever doesn’t always make your movie funny, or better yet, interesting. The only times that it really feels like Stillman himself seems all that invested in this material (that is, when he isn’t coming up with snappy-lines), is whenever he’s focusing on and playing around with Greta Gerwig and her character. As the perfectly-named Violot, Gerwig gets to be a lot of things that we know and love her for, as she’s quirky, odd, funny, realistic, always happy about life, sometimes thinks way beyond her head (and the stars for that matter), and has something to say, even if it’s only gibberish. Gerwig seems like she’s perfectly ready and capable of hanging around in Stillman’s world and it’s why she’s been able to transcend the “indie darling” title she’s been slapped with. However, because the movie loves Gerwig so much, it’s hard to care for anything else when she isn’t around. But it’s almost like Stillman himself knew that; after all, he’s working with so many characters that, after awhile, it just becomes a tad overstuffed and draining to keep up. Not to mention that because the movie doesn’t entirely care about developing these characters beyond “what other funny things they can say”, it’s hard to actually get invested. A part of me likes to think that Stillman knew this, which is why he doesn’t put the greatest effort into helping out Analeigh Tipton’s character, or the countless others who aren’t Greta Gerwig. Still, it’s fine to listen to these characters talk and go on and on, even if we don’t always know what it’s about, or what Stillman’s trying to say. He seems to want to make fun of the college-life, the sororities, the frats, and the people who just try so desperately to “fit in” and feel apart of something, but in the end, he just settles for clever one-liners. That’s fine and all, just maybe give me something more of a story or what have you. Or at least, one that’s worth caring about. 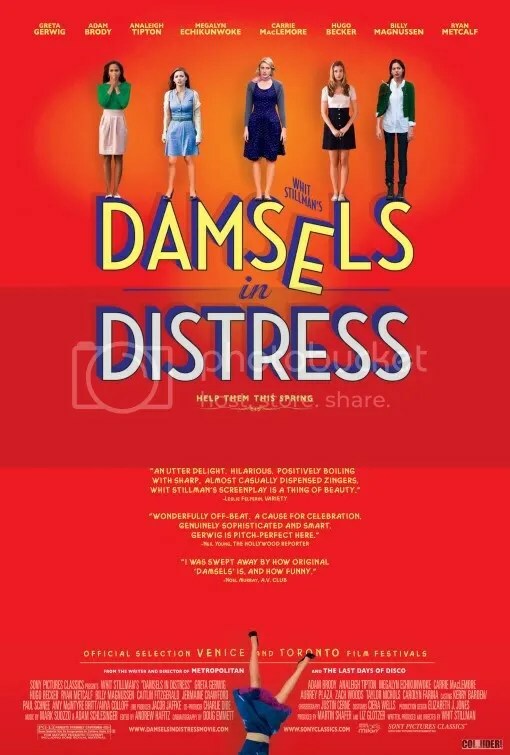 Consensus: When Stillman and Gerwig aren’t working their magic together, Damsels in Distress loses a little bit of luster, but still will keep you laughing in with its odd approach, even if it just takes a little while to get moving. Oh I absolutely loved this flick. The the dry oddball humor really hit home with me.